Rama is pursuing a business studies major, a long cherished dream. Her favorite subjects are business math and journalism. Her goal is to be an office manager in the business world. She comes highly recommended as a hardworking, intelligent young woman. In grade 7, Rama became ill with a crippling disease and lost a year of study. 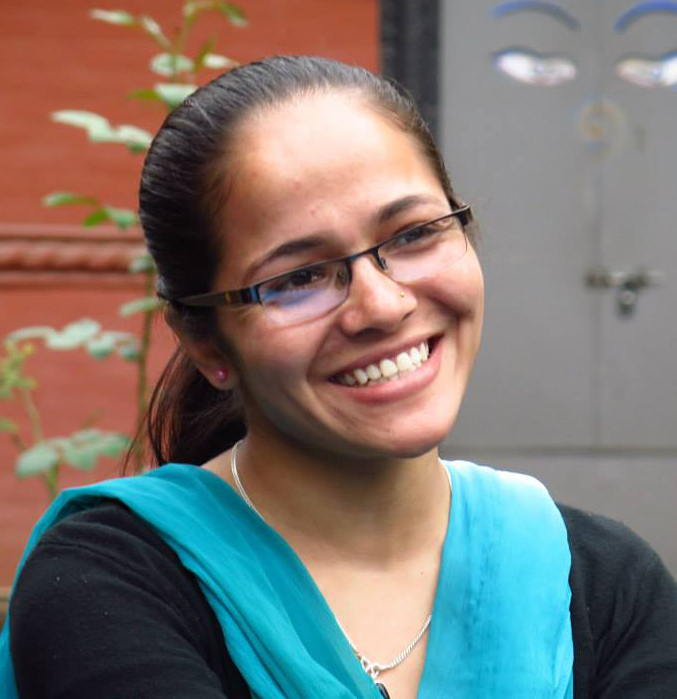 Originally from Pyuthan, she was sent to Kathmandu for treatment, where she completed high school while living in a home for disabled students. A serious, long-term bone infection in one leg has ruined her hip joint. Rama may be a candidate for hip replacement surgery eventually, but at this time the priority is to heal the infection. Although BMKF disburses funds related to education only, we partner with TRIFC org, doctors in Nepal, and other individuals to support Rama’s health. Rama always has lots of love, a big smile, and hugs for her friends. She is also a singer, songwriter, and philanthropist: In high school, Rama won a regional songwriting competition and used her award money to purchase a new door for the children’s rehabilitation center where she lived.